The Orienteering Achievement of 2011 - Vote for your candidate! 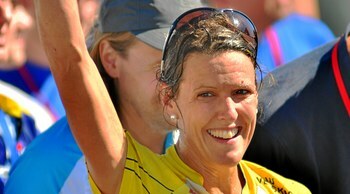 Welcome to the poll for the Orienteering Achievement of 2011 - Women, organized by World of O. The poll will be open from December 6th until December 12th. Deciding the dramatic WOC Relay for Finland after a bad start of the relay, a bad WOC and a disappointing first half of the season with a lot of sickness. The spectators present in Savoie, France at the World Orienteering Championship long distance final this year did not believe what they saw on the big screen: The 7 time WOC gold medalist Minna Kauppi gave up without even having found the first control after a gigantic mistake. After a season with a lot of sickness, it looked like this would not be Kauppi’s WOC. However, everything turned from grey to gold through Kauppi’s ability to perform in first-to-finish fights when it really counts: - It was the same as it always is [in a WOC relay]. I do a big mistake, and then there is big drama, and then we win, Kauppi said after the race. - This was the best gold medal ever. The Queen of the World Orienteering Championships 2011 with a medal in all disciplines: Gold in middle, silver in sprint and bronze in long and relay. The most happy orienteer of the year? Not far from it for Helena Jansson after her gold medal in WOC middle distance. 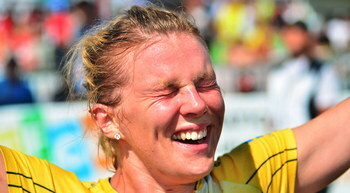 - It did not feel like a gold race, but it was, a very happy Jansson said after her race. After silver and bronze in sprint and long - the gold medal on the middle distance tasted very good for the popular Swedish runner. - It is unbelieveable. It was very difficult in the forest, the Swede said after her third medal of three possible. 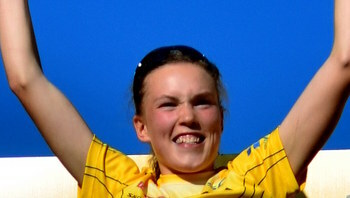 The gold medal was the first Swedish middle/short distance gold medal since Anna Bogren’s gold in 1993. 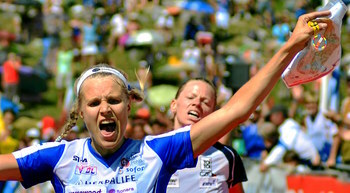 The positive vibe Jansson spreads around her makes her a joy for the spectators. As a junior winning the silver medal in the World Championships middle distance in France - after a few weeks earlier having taken three gold medals in the Junior World Championships. 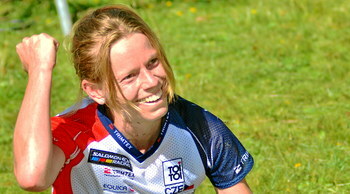 In 2008 Ida Bobach said "In 10 years I am a senior World Champ! But that is just a dream. 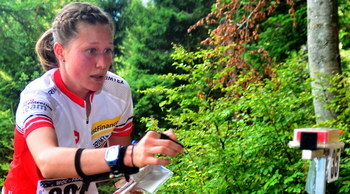 I think that in 10 years I am spending much time on elite orienteering and I am trying to be the world’s best orienteer." After three years, the fast Dane is only on step away from the top of the ladder - still as a junior. Bobach has had a fantastic career - and everything points towards her becoming one of the really big stars in orienteering in the years to come. A fantastic achievement! Photo: Torben Utzon. 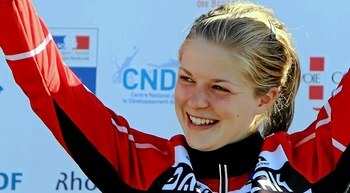 Going 100% for the sprint - taking the WOC gold medal in France. Dominating the World Champs long distance - winning the gold medal with more than 4:30, with 7:30 down to the bronze medal. Annika Billstam’s carrier as an orienteer started when she was 9 years old, in Järfälla OK. It ended at the age of seventeen - but luckily Billstam came back to the sport 8 years later studying in Uppsala. - I still have strong memories from one of my first races in Uppsala, Bllstam said when she was nominated for the Orienteering Achievement of 2008. - I did a technically good race but was more then ten minutes after the winner. I was surprised but had such good time in he forest and was strongly fascinated by the feeling of flow. - Since that day I´ve taken many steps towards my dream. To achieve a perfect race (so close you can come) in a World Championship, with this feeling of flow and happiness. Billstam’s lead was 47 seconds already at the 1st control at this years WOC long distance. The big surprise among the medal winners in this years World Championships - bronze medalist at the WOC middle distance. Finding the strength to be back on the top once again when it really counts: WOC silver in both long and relay. Dana Safka Brozkova has a remarkable ability to make her best performances when it really counts. Ahead of taking her fourth individual WOC medal in France this year with the silver medal on the long distance, Brozkova had not performed on this level since the EOC silver in Bulgaria in 2010. But in France it wasn’t over with the long distance silver for the Czech woman: In the thriller WOC relay in Savoie Brozkova run the Czech Team into bronze medal - just a few meters behind Minna Kauppi. Only 19 years old winning her first World Cup victory, winning the bronze medal at WOC relay and winning O-Ringen in the Elite category. Also sprint World Champion in ski orienteering. Tove Alexandersson is only 19 years old - and has already achieved more within orienteering than most others do within their lifetime. - In my 18th year I have participated in 4 World Championships, taken 7 Junior World Championships medals, taken 2 World Championships medals [...] and been nearly 20 weeks in training camps, Alexandersson writes on her blog. How many individual medals could this young Swede have taken in the World Champs if she would have been allowed to start in all the WOC races...? - The middle distance was the toughest, [...] it felt hard to yet another time only being able to cheer. Doing the performance of her life with the 5th place on the WOC long distance after loosing out in the qualification in the middle distance. Bagstevold was very disappointed after not getting selected for the World Championships on home ground in Trondheim in 2010 - a championship which would have been a perfect fit for the technically strong Norwegian runner. The WOC dream came through when qualifying for France in 2011 - but then Bagstevold failed to qualify for the middle distance final. 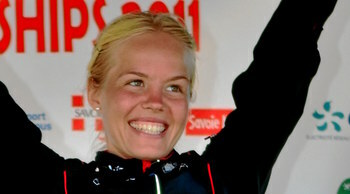 Bagstevold came back on the long distance, however, and made the performance of her life with a 5th place.